Standing in the middle of the log circle, a panoramic view of the woods takes in 360 degrees of young children totally absorbed in their play: a group of boys digging for dinosaur bones; a cluster of children making a den their home; a toddler collecting beech mast from the ground and two girls negotiating a rope strung between two trees. The children are taking part in one of Get Out More’s forest schools, a programme of play and learning in a woodland setting. Forest schools have really taken off in Britain since students from Bridgewater College imported the idea following a study trip to Denmark in 1995. The first Forest Kindergartens appeared when a Danish baby-boom lead to a shortage of nursery spaces, so out of necessity early-years educators took half of the group outdoors. Within a relatively short space of time they realised that the children who were spending more of their time outdoors were talking more, showing greater physical and social confidence and generally progressing quicker than their indoor peers. But how had the outdoor environment made such an impact on their learning and development? A checklist of the physical requirements of an ideal space for children’s learning and development would probably include a varied and dynamic space with room to run around, fixed equipment to provide physical exertion, risk taking and challenge and a wide range of movable resources for creative development and discussion. You can try to set that up in a home, nursery or school though you would probably be pushed for space. Landscape designers can incorporate the brief into their playground plans as much as the budget allows, but the beauty of the outdoors for the practitioner, teacher or parent is that nature has done your set up for you. A woodland or other natural space offers up a bounty of play and learning opportunities and children will naturally find them. There is plenty of evidence highlighting the shrinking world of children’s play and the media regularly reminds us of the dangers of raising a generation of ‘cotton wool kids’. But the good news is that children haven’t forgotten how to play outdoors, its just sometimes adults seem to have forgotten why they should. On the face of it, using the outdoors as a resource for children’s learning and development seems a relatively straightforward idea: fresh air, freedom and physical exercise are almost universally acknowledged as a Good Thing. But you can get those in a tarmaced playground. 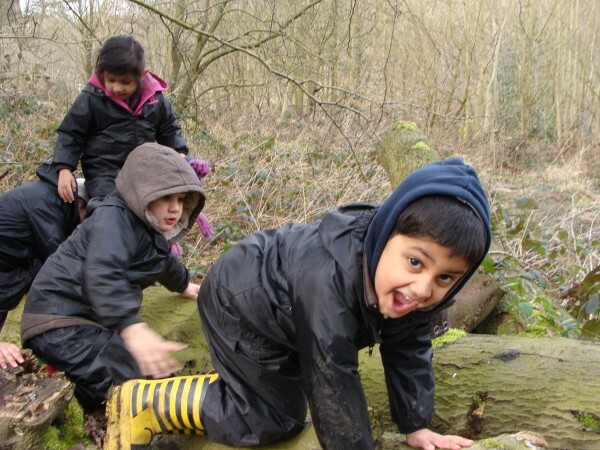 What is it about the wild and natural spaces that really brings the learning alive? Challenge and Risk: The uneven terrain and physical obstacles such as a dip in the ground, a fallen tree or pile of leaves, create a physical challenge requiring a response. Whether its crawling under, balancing on or kicking through, the challenge is hard to ignore, and with challenge comes risk. The immediate physical nature of nature helps children to push their own boundaries; can I climb this, can I jump off it, what happens if I go higher? As we return to forest school each week I see children revisiting an activity time and time again, stretching their skills and growing in confidence as they accomplish a new task. One day a boy who never spoke at nursery was the first to master the rope swing and called out for others to watch, ably demonstrating that the ability to take risks in one area helps us to conquer obstacles in another. Loose Parts: The woodlands are an ever-changing environment where the resources are plentifully scattered about and changing according to time of year. Sticks, leaves, seeds, fruit, mud, puddles, wind, sunshine will be more or less available according to the day and the season. Unlike that plastic toy or static piece of play equipment , these open-ended resources have no set of directions or pre-determined function. Therefore they can be moved, stacked, arranged, taken apart and put together with other resources in multiple ways. Is it a stick, or in fact a sword, a magic wand, a fence or a musical instrument? This limitless adaptability stimulates a world of creativity and imagination. In the woods I try to keep kit and planning to a bare minimum and be open to the possibilities that the season, weather or a chance discovery provide such as the hours and hours of play that a recently fallen tree or a new muddy puddle presents. Child Led: Outside of the limitations of four walls and the structure of a timetable or a task-focused activity we all feel more free to go with the flow. When a child is free to choose their own play they will follow their interests in their own way and are therefore more likely to be more engaged, take more ownership and develop a deeper understanding through their own discoveries. Without having to consciously cater to different personalities or learning styles, outside of the classroom children have the opportunity toengage with nature and take on a taskaccording to their own interests. At one of our holiday programmes a large group of children spent the afternoon making fairy villages out of sticks, leaves and pebbles. They worked alone and in pairs, they worked out which materials to use and how to fasten things together, they embellished a story, creating characters and rituals and afterwards spoke of their pride in the results. A single activity had simultaneouslyencompassed social, physical, intellectual, creative and spiritual learning and development. And they had no idea they were learning. Working with groups across the post-industrial landscapes of West Yorkshire, I am grateful that even in the busy conurbations of Keighley, Bradford, Leeds and Dewsbury, there are still quality woodlands and green spaces that can provide stimulating learning environments for children. Its not just that they areon our doorstep, free to access and require very little set up or clear up (beyond taking away what we brought with us, of course), It’s that every time we go its both different and the same; a constant and ever-changing natural classroom and playground full of challenge, creativity and stimulation waiting to be discovered. Annie Berrington is the Director of Get Out More CIC, a social enterprise which wants people to get more out of life through getting outdoors more. Get Out More runs forest schools, outdoor learning and community engagement programmes for people of all ages which aim to generate well-being through positive outdoor experiences.